Outlook is one of the best email clients out there. With a ton of features, user base keeps increasing by the day. One of the issues that have troubled some users of Outlook 2016 has been of PST file not showing emails. You downloaded all your emails to IMAP on your Outlook 2016 account and then exported the emails folder to a PST file. The file size has come to let’s say, 4 GB. When you open your Outlook PST file, there are no emails. If you encountered something similar or any other error that prevented access of your Outlook emails, we look at solutions to overcome this error. In the context menu, click IMAP message. Click View -> Customize Current View. Now click Filter -> Clear All. Does your PST file now contain emails? If your answer to this question is No, your PST might well be corrupted. Microsoft has a built-in repair tool in the form of scanpst.exe to repair all your corrupt Personal folders (PST) and Outlook data (OST) files. Note that to remove errors in your PST file, you need to run the scanpst tool for at least 6 to 7 times. Before you run your Inbox Repair Tool, ensure that Outlook is closed. Scanpst.exe is a hidden file. You have to enable Show hidden files and folders option in Folder Options. Under Hidden files and folders, make sure Show hidden files and folders option is selected. Now click Ok.
Click Start – > Search. Now type scanpst.exe in the search bar and hit Enter. If you were unable to view the Inbox Repair Tool, you can locate it manually. Double-click on scanpst.exe to open the file. Now click Browse to select your corrupt PST file. Select Start to begin the scan. If the scan returns errors, click on Repair to fix all the errors. Once the repair is complete, restart Outlook and check if you can see all the emails in your PST file. If your Outlook 2016 application is still not showing emails after trying the above methods, Remo Repair Outlook provides a simple solution to repair all your damaged or corrupted PST files and safely restore data from them. The repair tool works on a non-destructive mechanism, meaning that your source PST file is completely safe. Remo Repair Outlook first reads the contents of the file, extracts all the contents and then creates a healthy file by fixing all the errors. Hence, your Outlook data is safe. It overcomes limitations of scanpst.exe as well. The scanpst.exe tool cannot handle large PST files, password protected PST files. Remo Repair Outlook can repair PST files of all sizes as well as retrieve files from PST files that have password protection. 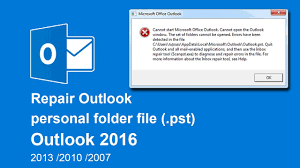 If you deleted any folder in Outlook by mistake, you can recover deleted folder in Outlook 2016 easily through Remo Repair Outlook. The repair tool works fine on all Windows and Mac Operating systems. Just download Remo Repair Outlook application and follow simple instructions to successfully repair your corrupt PST file.